Helen L. Nyquist of Howard Lake, MN, died on September 7, 2018, after a valiant battle with cancer. Helen was born June 6, 1935, in Olivia, MN, to Caroline H. (Duehn) and Thomas E. Kirkpatrick during the Great Depression. It was a particularly hot drought year in which her mother herded cattle along the nearby railroad track to supplement small feed rations. Despite the depression, Helen had a rich and full youth participating in 4-H, musicals and plays, piano and organ playing, and ruckus gatherings with relatives and neighbors. Of course, trips to the library and reading were always important to her. 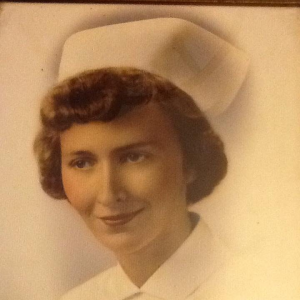 As a 1956 graduate of Swedish Hospital School of Nursing, she worked as a nurse at Swedish Hospital, Buffalo Hospital, Meeker County Memorial Hospital, Cokato Hospital, and the office of Drs. Houtz and Johnson. She loved her time as a nurse, especially working in the preemie nursery and fishing pills out of elderly mens’ beards who asked her to marry them. Survivors include her husband, Dan, her children, Mark, David (and Mariana), and Naomi (and Patrick); her adoring grandchildren, Corrie, Christina, Clarissa, Estera, Oliver, Aunne, Ezra, and Eleanor; and many relatives, friends, neighbors, and pastors. The family is especially grateful for Hutchinson’s Allina Hospice team. A simple graveside service was held on September 10 at Cokato Cemetery.